A Toyota genuine product at a very competitive price of *€19 incl. VAT. 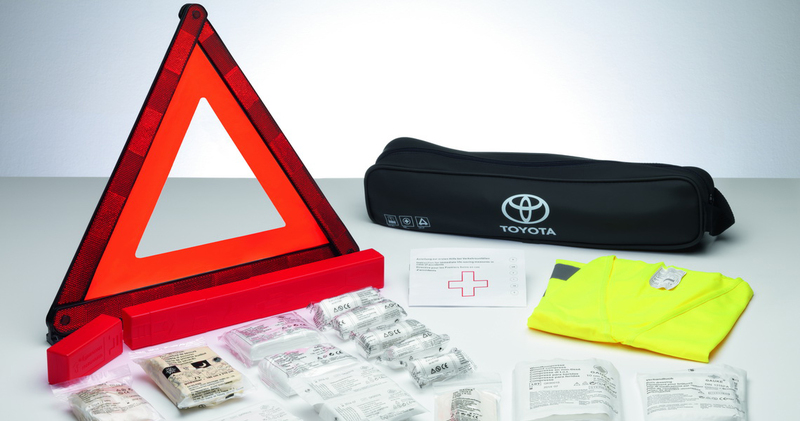 The Toyota Safety Kit includes a warning triangle, a safety jacket, as well as a first aid kit, all combined in a Toyota branded bag which can always be stored in the boot of your Toyota. Toyota Protect There’s nothing like the showroom gleam of a brand new car. Toyota ProTect is a revolutionary new NASA-derived coating which provides high-grade protection for vehicle surfaces, and is now available at Dickran Ouzounian & Co Ltd Toyota Accessories Package Offer Your Toyota is always special! Whether new or used. Renew it with the most essential accessories pack, which you can find at a special price. Genuine Toyota Wipers When it comes to being aware of your surroundings, whether you’re enjoying a country view or keeping an eye out for the car in front, crystal-clear windows are more than just a luxury, they are vital for you to drive safely in your Toyota. Aircondition Service Offers As the sun becomes a more familiar sight, thoughts turn to the exciting adventures that summer has in store. To get your Toyota ready for the fun that’s ahead, we offer two maintenance services for your vehicle's air-conditioning system, that you can’t resist. Rear Parking Sensors Offer Parallel parking on today’s busy roads or squeezing into a tight space in a crowded car park is enough to test the nerves of even the most experienced driver. The parking aid system is a big help because it takes the guesswork out of judging distances to obstacles. Service Discount Offer Whatever the age of your Toyota, our experts know it inside out and they’ll service it using only genuine Toyota parts. Our Toyota Trained Technicians always make sure your car is more than serviced, it’s been properly cared for. 50% Discount On *Textile Floor Mats Whether you take your car to one of our Toyota workshops, or visit our parts counters, we only supply Toyota Genuine Accessories which are specifically designed and tested for your vehicle. Toyota Genuine Parts Tackling the school run, defeating the weekly shop, or even transporting you on that summer break, your Toyota is at the heart of your day-to-day life. With this in mind, we developed Toyota Genuine Parts to maintain the quality and guarantee the long-lasting performance of your car.